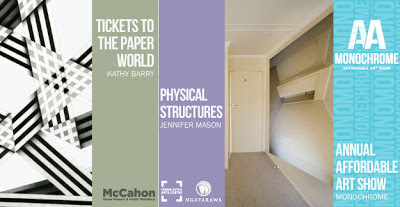 17th McCahon House Artist in Residence Kathy Barry will present her post-residency exhibition of graphite drawings Tickets To The Paper World in conjunction with Jennifer Mason’s photographic documentations of vacant domestic interiors in Physical Structures at Corban Estate Arts Centre from 16 November – 20 January. Kathy Barry’s graphite-drawings engage the formal language of geometric abstraction and provide a sense of both construction and unravelling, folding and unfolding. These drawings couple finely rendered detail with visual paradox, which speaks to drawing’s ability to contain both the concrete and the ineffable. On Saturday 17 November, artist Kathy Barry will present a public exhibition talk, followed by the curator’s tour of Jennifer Mason’s Physical Structures. In addition to these two solo exhibitions, Corban Estate Arts Centre’s Annual Affordable Art Exhibition is on display 16 November – 6 January, with artists invited to submit artworks for the annual affordable that work within the colour palette parameters of the monochrome – that is, artworks which feature either one colour or shades of one colour. Artworks explore the potential of colour in this exercise and investigate the significant heritage this technique has in art history. This is a cash ‘n carry exhibition and is aimed at being affordable to visitors over the Christmas period. To find out more about these exhibitions and Corban Estate Arts Centre’s ongoing activities, programmes and events visit: www.ceac.org.nz or contact us at: info@ceac.org.nz or by phone at (09)838 4455. Corban Estate Arts Centre is open seven days a week, from 10am to 4.30pm except for public holidays and over the Christmas/New Year period.